Book a cheap private taxi or bus from Malaga airport to Tarifa with our transfer services filling in the form on the top. Distance from Malaga: 151 km. Time to reack: 1h and 35 min. 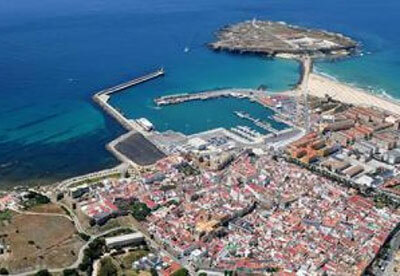 Tarifa is a municipality belonging to the province of Cadiz, with a population of barely 18,000 inhabitants. The town of Tarifa is situated at the southernmost point of Europe, from where you can see the coast of Africa, being only 14 kilometres away. Furthermore, Tarifa is located near Gibraltar, Algeciras or Linea de la Concepcion. The town has the distinction of being the only place in the continent where meet the waters of the Mediterranean Sea and the vast Atlantic Ocean. A place full of events during the history of Spain due to its geographical position. 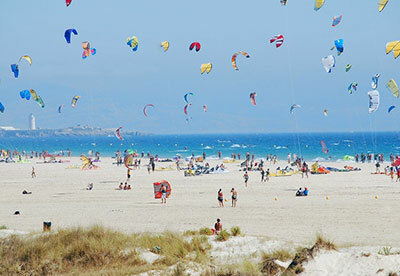 The beaches of Tarifa receive visits from both tourists and locals from Cadiz looking for warm weather and strong winds. These visitors come with the purpose of practicing water sports like Surfing, Windsurfing, Kite surfing and all those exercises involving both beach well as a considerable wind. In Tarifa is also common the practice of scuba diving and water skiing. In most cases the tourists come to spend the day on the magnificent white sandy beaches in pristine environments, which is undoubtedly the key to its charm; a place which is adored by surfers. Would you like to practice some of this activities? Learn more about our Malaga excursions and travel to Tarifa on your holidays. In Tarifa and its vicinity there are offered as well other entertainment alternatives; you can watch the carefree flight of birds, watch the beautiful dolphins swim, enjoy the special experience of horse riding or safe rock climbing and other activities that will appeal to all lovers of nature. 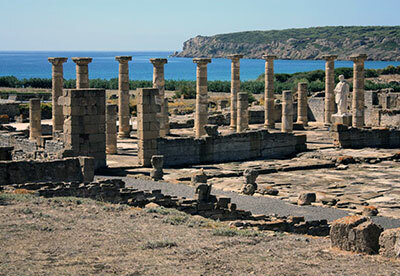 Archaeological finds discovered in Tarifa revealed the presence of the Phoenicians in the city, who were finally the real founders of the municipality; on the other hand, it is known that this area was frequented by Neanderthals, as there has been discovered a skull dating back 60,000 years. Tarifa belonged to the Arab kingdom for several centuries from 711 and this long period of time is reflected in the city with monuments as the Caliph’s Castle or the Puerta de Jerez and many of its streets. 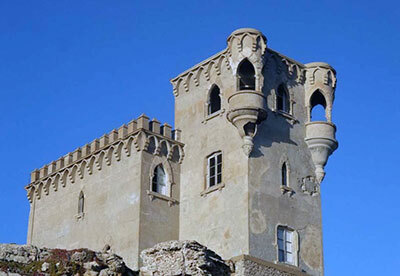 We also find curious the small island of Tarifa which is connected by a road, near the port, a peculiarity which shares the city of Cadiz with it castle de San Sebastian. It is also very interesting to visit the Christian church of San Mateo built during the sixteenth century; the Renaissance style Santa Catalina Castle; the cave Cueva del Moro in Tarifa which inside hides some ancient cave paintings, and of course enjoy the quiet and beautiful beaches of Cadiz such as Valdevaqueros beach. Or a little further from the city, the wonderful beach of Bologna where lie the ruins of the ancient Roman city of Baelo Claudia whose foundation dates from the second century BC. Economytransfer offers a means of transport completely personalized for your holidays in the Costa del Sol thanks to Malaga airport transfers.